Any security-conscious enterprise will want to have visibility of which users have local administrator privilege on any given system, and if you are an SCCM administrator then the job of gathering this information will likely be handed to you! However, this task may not be as simple as it seems. Gathering the membership of the local administrators group is one thing, but perhaps more important to know is whether the primary user of a system has administrator privileges. If that user is a member of a group that has been added to the local administrators group, then it isn’t immediately obvious whether they actually have administrator rights without also checking the membership of that group. 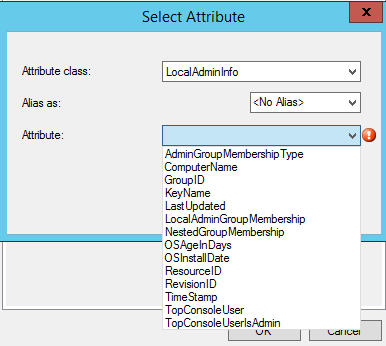 And what if there are further nested groups – ie the user is a member of a group that’s a member of a group that’s a member of the local administrators group?! Obviously things can get complicated here, making reporting and compliance checking a challenge. Thankfully, PowerShell can handle complication quite nicely, and ConfigMgr is more than capable as a both a delivery vehicle and a reporting mechanism, so the good news is – we can do this! The following solution uses PowerShell to gather local administrator information and stamp it to the local registry. A Compliance item in SCCM is used as the delivery vehicle for the script and then RegKeyToMof is used to update the hardware inventory classes in SCCM to gather this information from the client’s registry into the SCCM database, where we can query and report on it. To start with, let’s have a look at some of the PowerShell code and the information we will gather with it. First, we need to identify who is the primary user of the system. Since the script is running locally on the client computer, we will not use User Device Affinity. True, UDA information is stored in WMI in the CCM_UserAffinity class, in the ROOT\CCM\Policy\Machine\ActualConfig namespace. But this class can contain multiple instances so you can’t always determine the primary user that way. A better way is to use the SMS_SystemConsoleUsage class in the ROOT\cimv2\sms namespace and query the TopConsoleUser property. This will give you the user account who has had the most interactive logons on the system and for the most part will indicate who the primary user is. Next, to find if the user is a local admin or not, we will not simply query the local administrator group membership and check if the user is in there. Instead we will create a WindowsIdentity object in .Net and run a method called HasClaim(). I describe this more in a previous blog, but using this method we can determine if the user has local administrator privilege whether through direct membership or through a nested group. The SID for the local admin group (S-1-5-32-544) is used as this is the same across all systems. This will only work for domain accounts as it uses kerberos to create the identity. Now we will also get the local administrator group membership using the following code (more .Net stuff), and filter just the SamAccountNames. Next, if the user is a local admin through nested group membership, I will call a custom function which will check the nested group membership within the local admin group, for the user account. Let’s say that Group B is a member of Group A, which is a member of the local administrators group. We will check the membership of both Groups B and A to see which ones the user is a member of, and therefore which group/s is effectively giving the user administrator privilege. We do this by querying the $GroupPrincipal object created in the previous code. The custom function will query nested membership up to 3 levels deep. Now I will query the Install Date for the operating system, since in some cases where a machine is newly built, the TopConsoleUser may not yet be the primary user of the system, but the admin who built the machine, for example. This date helps to identify any such systems. The script will create the key if it doesn’t exist. You can see in this example, that my user account is a local administrator both by direct membership and through nested groups. The actual groups that grant this right are listed in the NestedGroupMembership property. 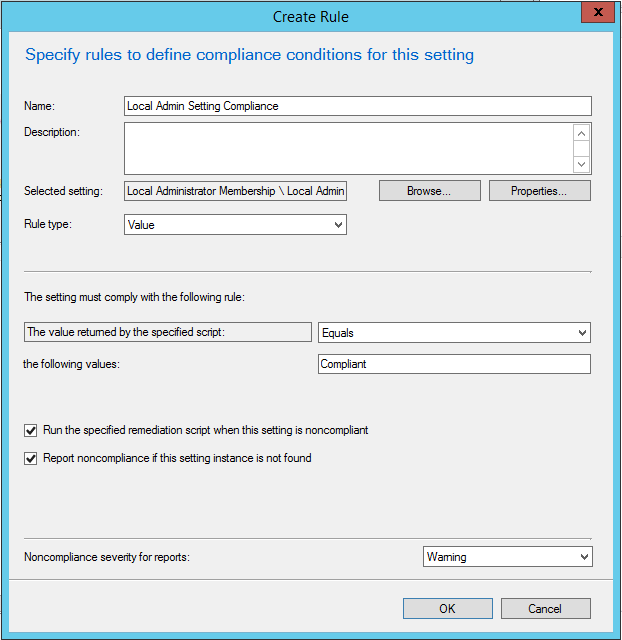 Now lets go ahead and create a compliance item in SCCM to run this script. 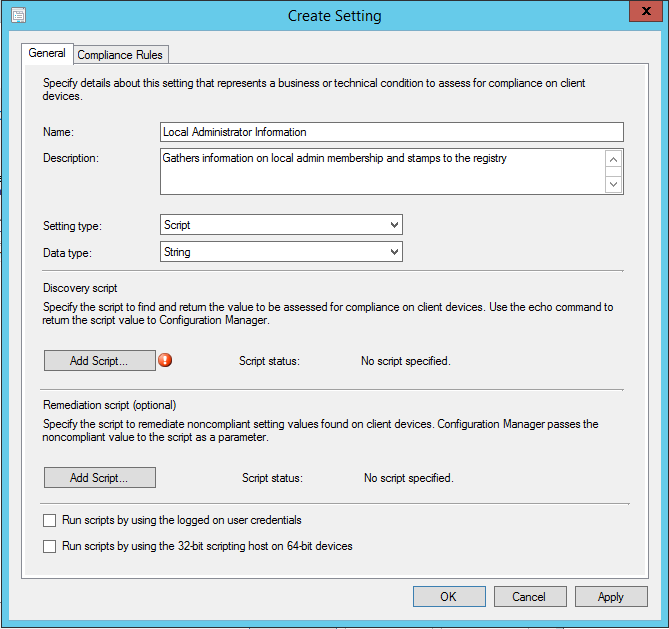 In the Console, navigate Assets and Compliance > Compliance Settings > Configuration Items. Click Next and select which OS’s you will target. Remember the Windows XP and Server 2003 may not have PowerShell installed. Click Next again, then click New to create a new setting. Choose Script as the setting type, and String as the data type. Click Add Script and paste or open the relevant script for each. Make sure Windows Powershell is selected as the script language. The discovery script simply checks whether the script has been run in the last 15 minutes, and if not returns non-compliant. This allows the script to run according to the schedule you define for it, ie once a day or once a week etc, to keep the information up-to-date in the registry. Click OK to close the Create Setting window. Click OK to close, then Next, Next and Close to finish. 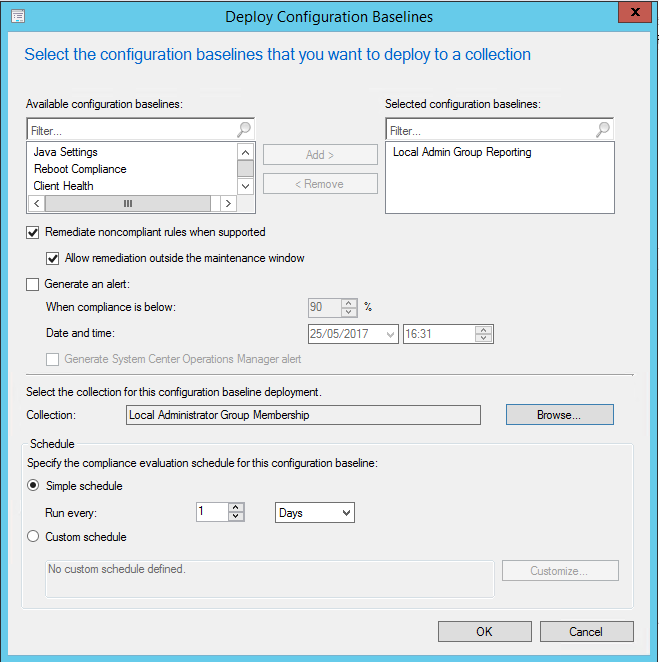 Click on Configuration Baselines and Create Configuration Baseline to create a new baseline. 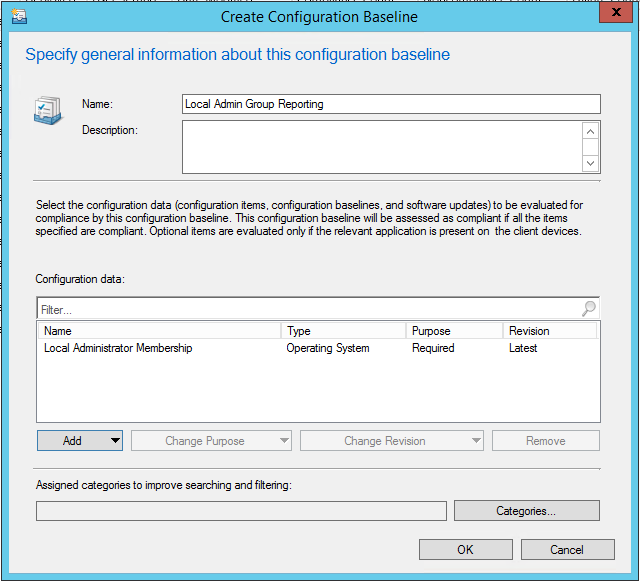 Give it a name, click Add and add the Configuration Item you just created. Right-click the baseline and choose Deploy. Make sure to remediate noncompliance and select the collection you wish to target. You will also need to do this on a machine that has either run the remediation script to create the registry keys, or has run the configuration baseline. You can deselect the ‘Enable 64bits …’ option as the registry key is not located in the WOW6432Node. Click Save MOF to save the required files. Copy the SMSDEF.mof and the CM12Import.mof to your SCCM site server. 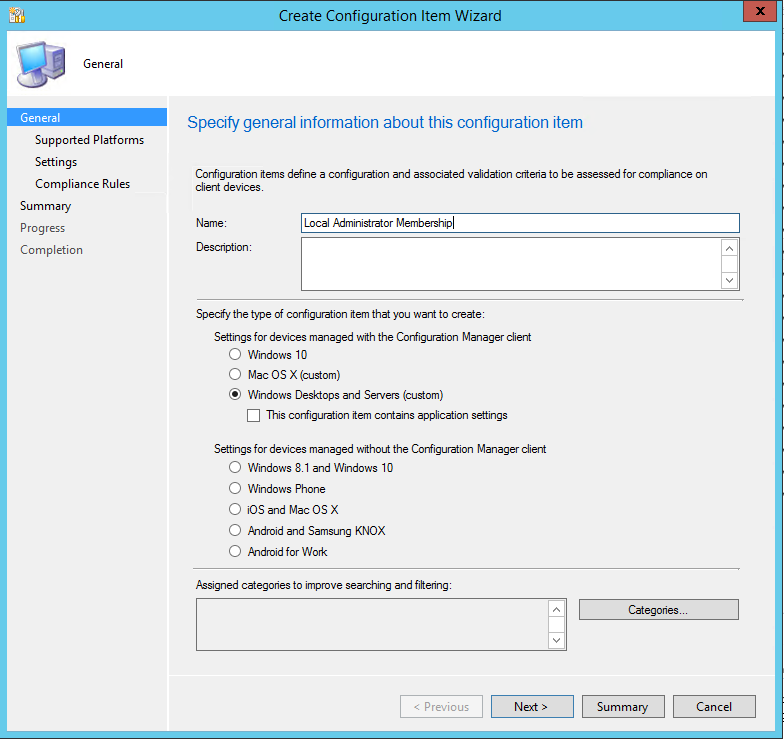 In the SCCM console, navigate Administration > Site Configuration > Client Settings. Open your default client settings and go to the Hardware Inventory page. Browse to the CM12Import.mof and click Import. Close the Client Settings windows. Now open your configuration.mof file at <ConfigMgr Installation Directory> \inboxes\clifiles.src\hinv. …paste the contents of the SMSDEF.mof file. Save and close the file. 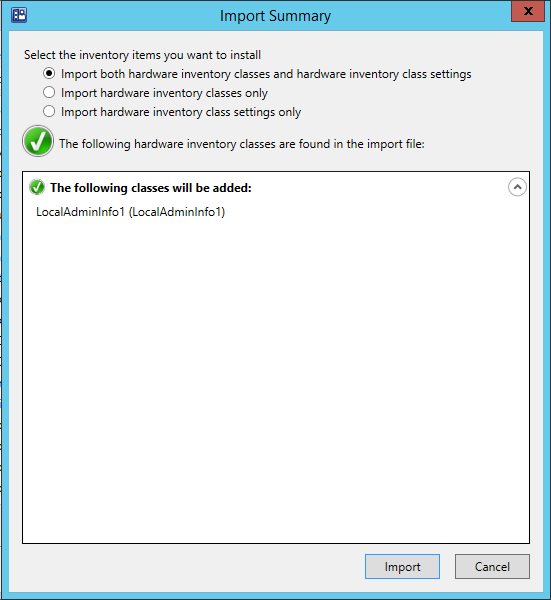 Now that you’ve deployed the configuration item and updated the SCCM hardware inventory, a new view called dbo.v_GS_LocalAdminInfo0 has been added to the SCCM database. Note that initially there will be no data here until your clients have updated their policies, ran the configuration baseline, and ran the hardware inventory cycle. …or create yourself a custom SCCM report, create an Excel report with a SQL data connection, query the SCCM database with PowerShell – whatever method you need or prefer. 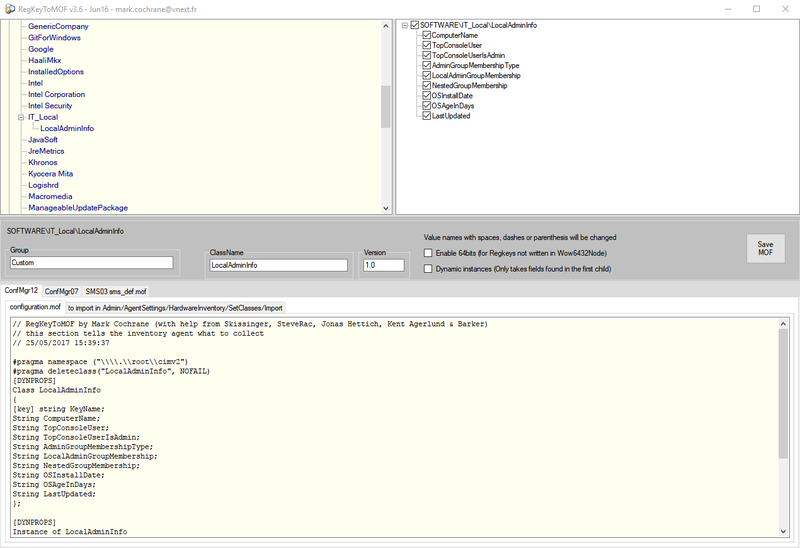 Here is a sample SQL query that will query the view and add some client health data and the chassis type to help distinguish between desktop, laptops, servers etc.